Just arrived in Madrid? 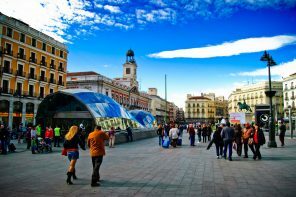 Then head straight to the handsome main square of Plaza Mayor! Hop from tapas bar to tapas bar, watch the street performers and take part in Madrid’s endless cultural events. You have arrived. 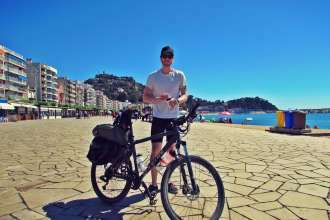 All words & photos by your Madrid meandering guide, Ben Holbrook. 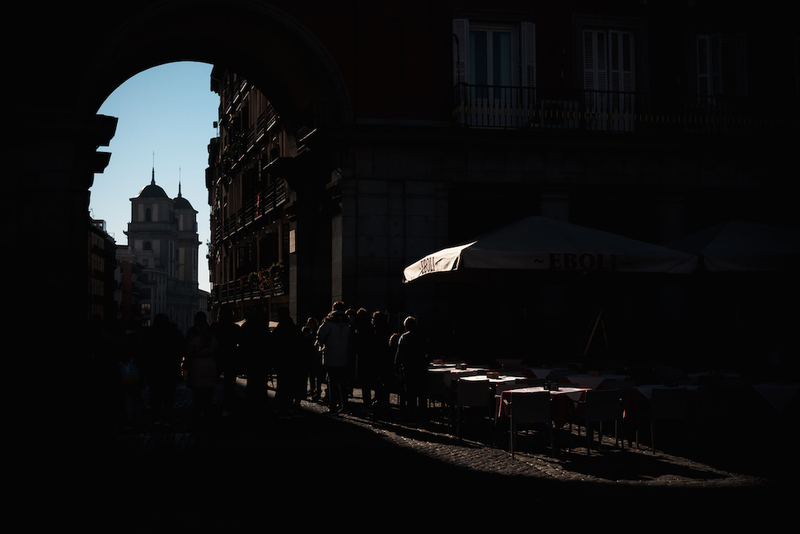 Dating back to the 17th century, Plaza Mayor is the cobblestoned heart of Madrid and the main point of reference for many of the city’s residents and visitors. Its history is spiked with controversy and gruesome tales, but today this peaceful grand square is the ideal place to explore traditional restaurants and bars, and take part in the city’s most important celebrations. 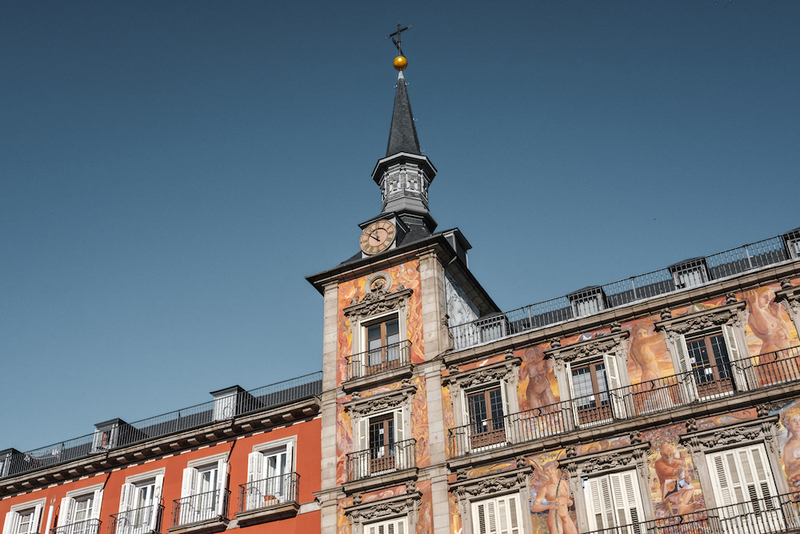 Whether you’re in need of a fix of culture or local foodie hotspots, Plaza Mayor and the labyrinthine streets that surround it are a must for everyone visiting Spain’s regal capital. Plaza Mayor was built on the site of an ancient market square known as Plaza de Arrabal. The square was completed under the reign of King Philip III in 1619 and you will find a huge bronze statue of him on a horse in his honour. Rampaging fires plagued the square throughout the 1600s, but it was quickly rebuilt each time in the same style. Since day one, this large, open-air space has been a sort of stage for all that was controversial about Spain. Crowds of 50,000 revellers would flock here to watch public executions during the Spanish Inquisition, where the condemned were tortured, burned at the stake, garrotted (choked to death) and hung. Bullfights were another common theme, especially when the city was celebrating royal coronations, weddings and births. 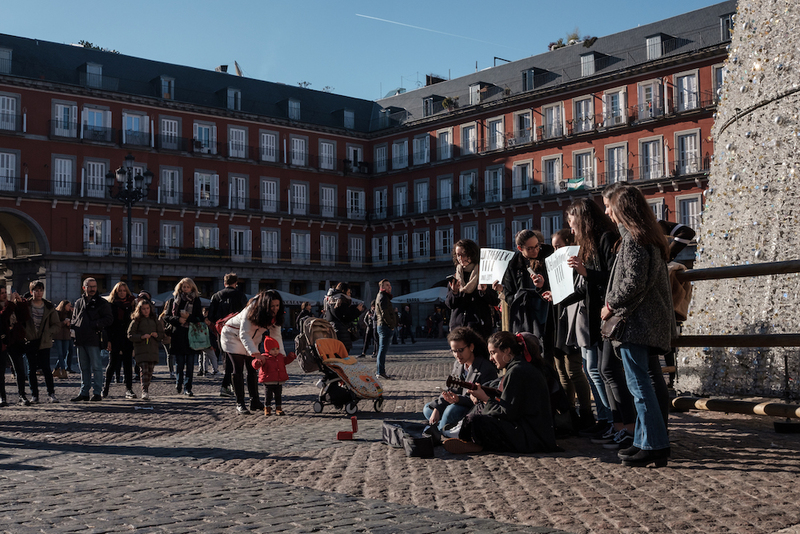 Plaza Mayor is home to Madrid’s main tourist office, the Centro de Turismo Plaza Mayor, which is the best place to get up-to-the-minute information on local events. Unlike many central squares in Spain, Madrid’s Plaza Mayor is filled with residential buildings. 237 balconies, all ochre and wrought-iron, look out directly over the hustle and bustle of the square below, making these handsome homes among the most exclusive in Madrid. You can even rent one to stay in during your vacation! Though it sounds like a fancy place for royals to splurge on fancy cakes for fancy parties, the Real Casa de la Panadería (Royal Bakery) was actually designed to house Spain’s Bakers’ Guild. These offices controlled the price of grain throughout the country, making it an extremely important and powerful institution. Today, it’s free to enter the building, although its most famous assets are the elegant fresco paintings that adorn the facade. Plaza Mayor hosts all sorts of markets and fairs, but the most famous (and quirky) is the weekly ‘Stamp and Coin Market’, which takes over the plaza every Sunday morning. 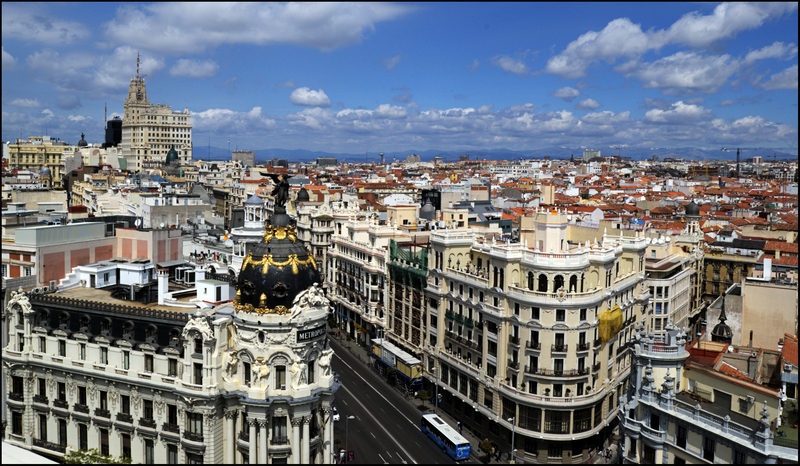 Whether you’re an avid collector or not, you’re sure to find something special to remind you of your time in Madrid. Tip: Every December Plaza Mayor springs to life for the annual Christmas Market, a cherished tradition since 1860. Throughout Plaza Mayor you’ll find carvings on the lampposts, each telling a different story from the square’s past. Discover scenes of the bustling old market, of raging fires and the infamous Spanish Inquisition. Wander your way down the narrow streets that lead off the square and you will find all sorts of colourful shops and boutiques, many housed in ancient ateliers and workshops. I remember seeing the crowds of people waiting to get into the famous Casa Hernanz shoes shop where they hand-make traditional Spanish espadrilles (like sandals made with canvas and esparto rope). 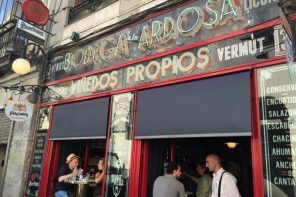 There are hundreds of dishes to explore in Madrid, but if you want to eat like a true madrileño then you simply must bite into a bocadillo de calamares (fried squid sandwich). 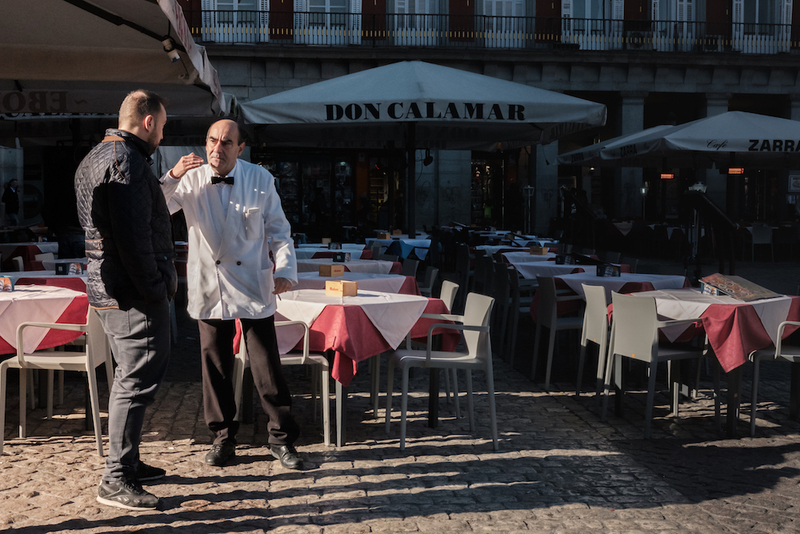 The restaurants that line Plaza Mayor are the city’s most famous places to eat it. 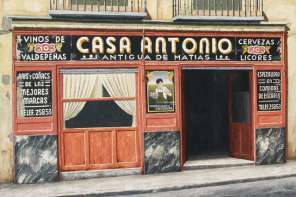 They’re all great, but I highly recommend the small and homely Casa María. Be sure to order an ice-cold caña (draught beer) to see it away with! 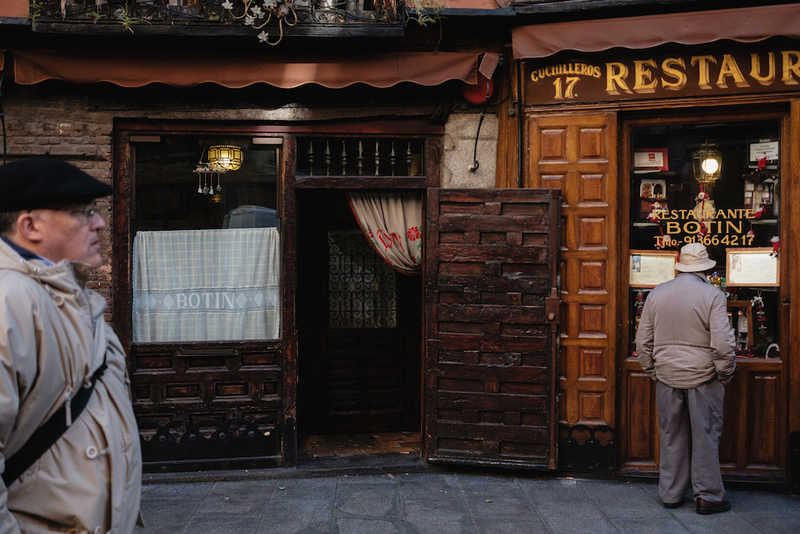 Sobrino de Botín is the oldest restaurant in Madrid – and thought to be the oldest restaurant in the world today. 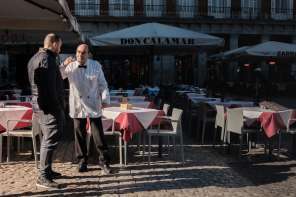 Tucked away on one of the many arcade streets leading off Plaza Mayor is the world’s oldest restaurant (according to the Guinness Book of Records). 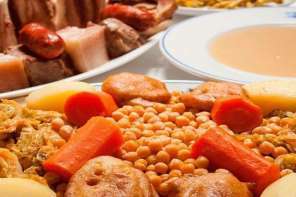 Dating back to 1725, Botín is world-renowned for its roast lamb and suckling pig, which the staff cook over vine shoots in a huge old oven. Be sure to arrive early so you can take a little tour of all four rickety floors. And if possible, ask to be seated in the vaulted basement bodega, the restaurant’s old wine cellar. 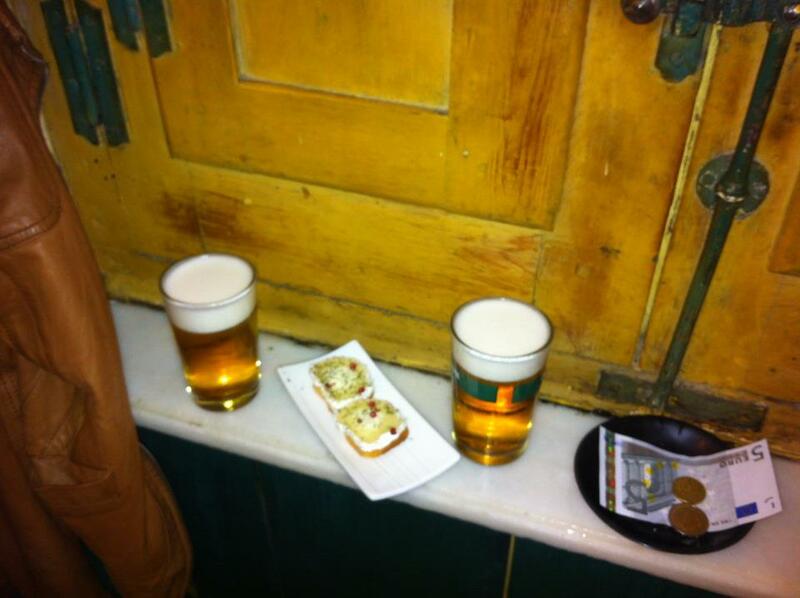 As a rule, I find the best tapas bars in Madrid are always the noisiest and most chaotic. 120-year-old Casa Revuelta, just a quick stroll from Plaza Mayor, is the perfect example. Maddeningly busy and sparsely decorated, many travellers overlook it entirely on their quest for something more civilised, but they’re missing out in a big way! 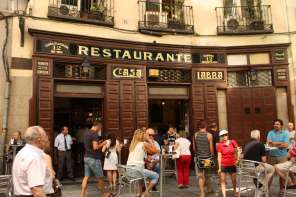 It’s famous throughout Madrid for serving the finest ‘bacalao’ (deep-fried cod) in town. Salty, succulent and crispy on the outside, it really is the stuff of foodie dreams. Located just outside Plaza Mayor, this elegant 20th century market is one of the oldest and most beautiful markets in Madrid. With its trendy stalls and wine bars, it’s a popular meeting point for well-heeled gourmets, who come to indulge in the finer things in life. 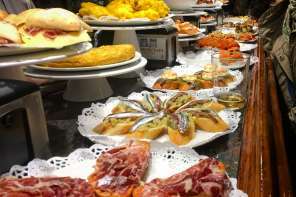 Explore stalls like Lhardy and Carrasco Guijuelo for A-grade Spanish jamón (ham), gourmet cheeses and all sorts of tempting tapas. Prices are a little higher than elsewhere in the city, but it’s absolutely worth spending the few extra euros to experience this world-class dining experience.